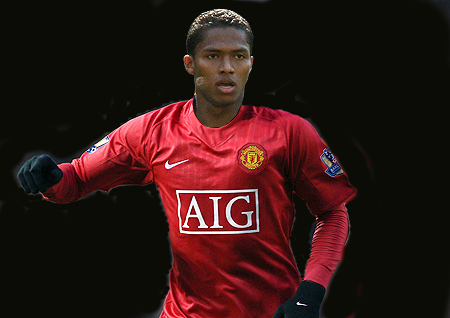 Luis Antonio Valencia Mosquera, commonly known as Antonio Valencia, is an Ecuadorian footballer who currently plays as a winger for Manchester United and the Ecuadorian national team. After progressing through the youth system at El Nacional, Valencia became a first team regular and made over 80 appearances for the club before signing for La Liga side Villarreal CF in 2005. He only made two league appearances for the Spanish side in between successful loan spells at Recreativo de Huelva for the 2005–06 season and later English Premier League club Wigan Athletic from 2006 to 2008. Wigan later signed Valencia on a three-year deal for an undisclosed fee in January 2008. His performances for Wigan soon attracted attention from several high profile clubs and he turned down a move to Real Madrid before signing for Manchester United in June 2009. Valencia has since won the 2009–10 Football League Cup, the 2010 FA Community Shield, and the 2010–11 Premier League during his time at Manchester United. He was also voted into PFA Team of the Year in his debut season. In the International front, Valencia made his Ecuador debut in 2005 and scored two goals in the process. He represented his country at the 2006 FIFA World Cup, the 2007 Copa América and the 2011 Copa América. Since making his debut, Valencia has won 52 caps and scored six goals for his country. Which positions should Manchester United upgrade in January?